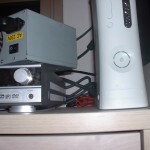 I Followed the mod presented in hackaday since my original Xbox 360’s PSU burnt up. 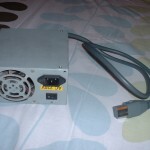 Result: clean and cheap working power supply that does not overheat. How can’t I post images? For the intrested ones, here is a fast scheme of the 360’s power cable and ATX short. hey, have you had any problems playing some games? I’m using the atx psu as well but it resets in the middle of some games. Have you tried using the blue power-enable to turn on the power supply? I think I need to add a NOT gate for it to work. I have yet to ‘investigate’ how the blue cable works. could anyone tell me which wires i use and which of the six xbox holes should go in what holes?.i have no xbox supply so i want to solder wires straight from atx switching box,any help would be great.thanks. Any help would be greatly appreciated, tahnks a lot! Okay, My Xbox 360 power supply just got fried and I don’t know what to do x[. I want to know how to make a 360 power supply out of an ATX PSU but don’t know the steps. Is it hard? how many amperes on the 12v land 5v lines? ok, I did it. but I want to keep the PSU awake so I don’t have to reset time each time I turn on the 360. Is there away to keep it awake but with no fans running? Anyone? They say you can use a NOT gate with the GREEN and BLACK (as shown on second picture) with the blue PWR_ENABLE wire. Hello, I got an xbox360, but my PSU screwed up. I’ve followed your instructions but I got a problem. In the scheme of the 360’s power cable: red wire goes to upper-left corner and blue wire goes to upper-right corner (in front view) of the power cable, my problem is: with a continiuty test I’ve tested that my red wire goes to the upper-right corner and blue wire to upper-left corner of the 360’s power cable, what can I do? 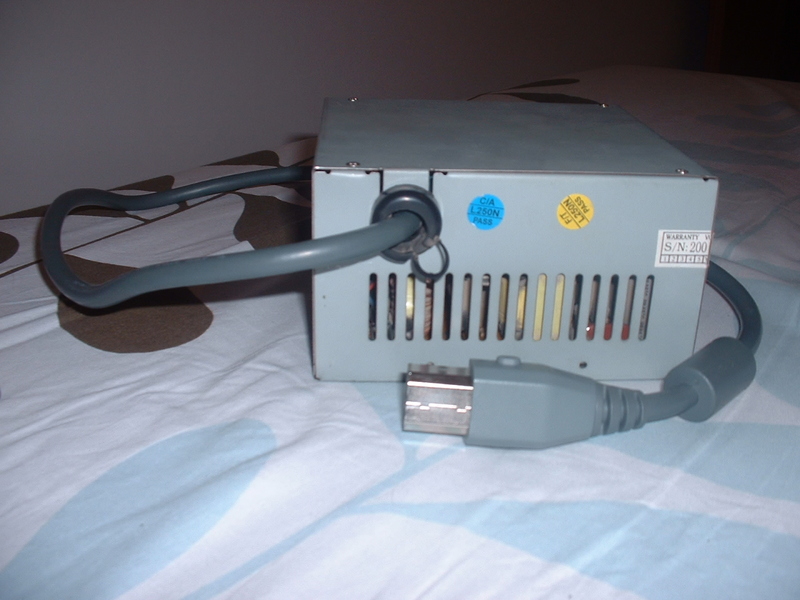 The image shows the back of the xbox360, not the cable layout. ok heres what i got 4 yellow 4 blacks 1 red and 1 blue + the sheild on the cable witch is a ground any ideas on what to do? can anyone help me , i got a xbox 360 with a psu that has a power cord with only two pins , and that thing that goes into the outlet has also two pins but they are in an angle , what is interesting is that the psu has the same specification as a normal psu (PAL) so i figured that the only thing needed to be changed is the power cord, what should i do ? Help! 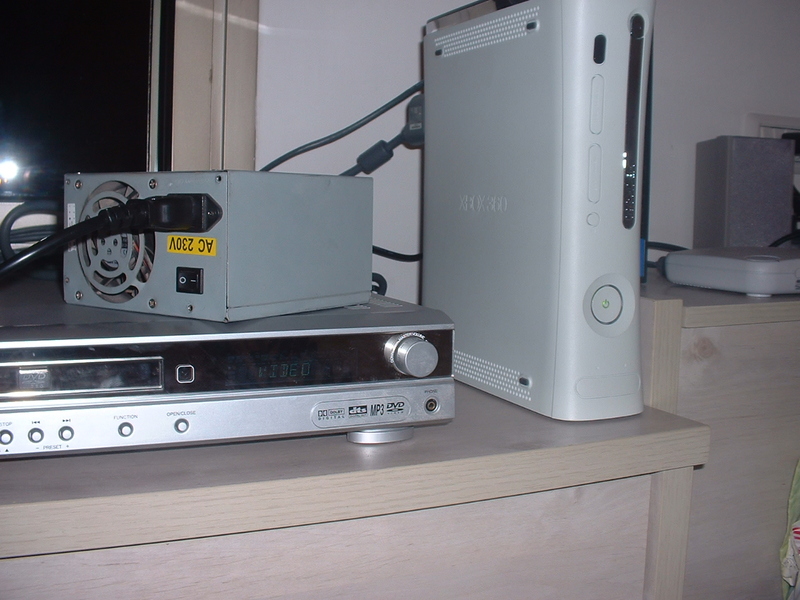 my xbox 360 psu went pop and I have an original xbox and have got the psu out of there, will the xbox 360 work with the old xbox supply, does anyone know how to wire it up? I have the standard hard disk cable connector and have cut it off and matched the colours on the xbox 360 power cable but nothing happens when I turn it on. BY THE WAY, I DID THE PSU MOD AND SO FAR THE CONSOLE WORKS PERFECTLY.. THE REAR DOES GET MILDLY HOT. IVE NEVER PLAYED XBOX BEFORE, BUT I THINK THIS IS NORMAL. AND OH YEA… THE PSU I USED WAS A $23 SHIPPED-SUNBEAM 480W FROM N*WEGG. When you said “Black to 6 black” did you mean all 4 black wires from the power cord with 6 from the ATX PSU? (Same thing with yellow). And do I wrap all wires of the same color together? Thanks in advance! ^Sorry, didn’t notice the digits before black and yellow ^^. yup, you wire all the same colors together. what i did was i combined all the same colored wires from the atx first, then did the same for the cable, then combined those two resulting (thicker obviously) wires together. >>> THE WIRES REALLY WERE VERY HOT, AND I THINK THIS IS THE SOURCE OF THE PROBLEM: YOU NEED A LOT OF INSULATION AROUND THE WIRES, AS YOU NOTICE ON THE 360 POWER CORD, VERY THICK CABLE. OTHERWISE, YOU’D HAVE MELTED WIRES. >>> I’M ACTUALLY ABOUT TO REDO MINE TODAY. I WOULD WIRE THEM THE SAME WAY. BUT I WOULD KEEP ALL THE INSULATION/SKIN/SHIELDING,ETC THAT I STRIPPED OFF FROM THE 360 CORD. AND I WOULD USE THOSE MATERIALS TO INSULATE THE NEWLY JOINED WIRES. *BUT DON’T TAKE MY ADVICE AS A GUARANTEE.. I HAVEN’T TRIED IT YET EITHER. BUT HOPEFULLY IT SHOULD SOLVE THE ISSUE. disregard EVERYTHING I SAID ABOVE!! the console still worked fine with that method, but not for a long term. >>> AFTER I DID THE CONNECTIONS THIS WAY, THE CONNECTION SITE NEVER GOT HOT ANYMORE!!!! THE 360 STILL WORKS PERFECTLY, SINCE I’VE CONNECTED THE WIRES THE NEW WAY. Is this method still working for you? I really hope so, ’cause I’ve tried every possible way except this one, and it gives me 3ROD every time. I’ll try this tonight. thanks for sharing! 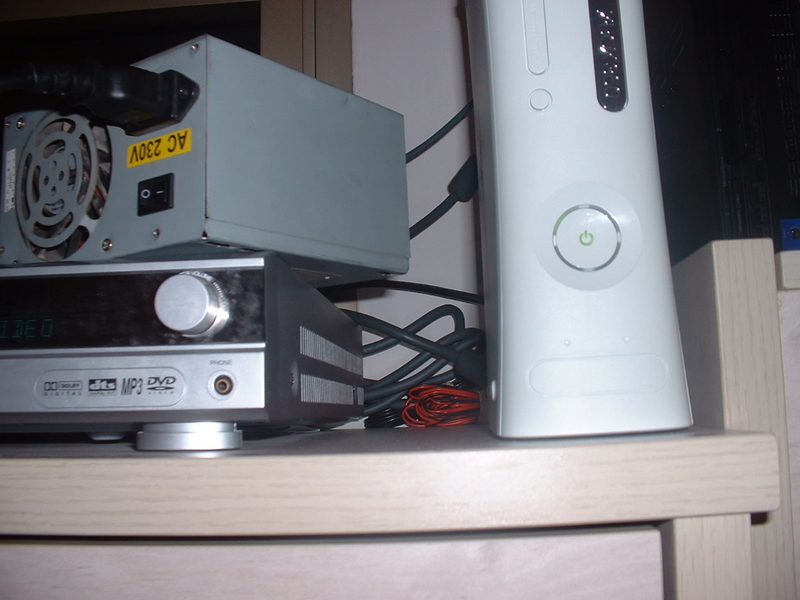 You can make the power supply turn on with the xbox360 as follows. The blue wire from the xbox goes to +5VDC when the power button is pressed. To make it activate the power supply you have to connect it via a 10K resistor to the base of an BC548 NPN transistor. 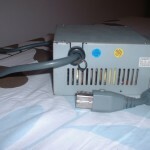 The collector is connected to the green wire to the power supply and the emitter is connected to ground. I have done this on mine and it works perfectly. Hi! If I’ve got an ATX with 12V@15A, will it work? Thank you! First time i got it working, then i wanted to make it nice and cut all the other cables and wanted to solder from the inside, as liranuna has done shown in picture.. But doesnt work now..
1. Can i solder the green one with any black one, or does it have to be that black one from pin 15? 2. Do you have any pictures of how it looks from the inside of the PSU? 3. Was it ok that i cut all other cables? Let me know what i have done wrong..
yea, u can bridge the green atx wire with any black atx wire. – u melted part(s) of the wire(s) from soldering. u actually dont even need to solder the green and black. just twist them together and cover with electric tape. they won’t get that hot. please take a look to see if your great blog is not being scammed by this crappy google-like site. All i can say… Is this works wonderfully….. My friend gave me his old X-box 360 that had the infamous “Red ring of death” I ended up replacing the old Thermal compound because i wasn’t sure if it was that or the PSU…. Turned out to be the PSU…. 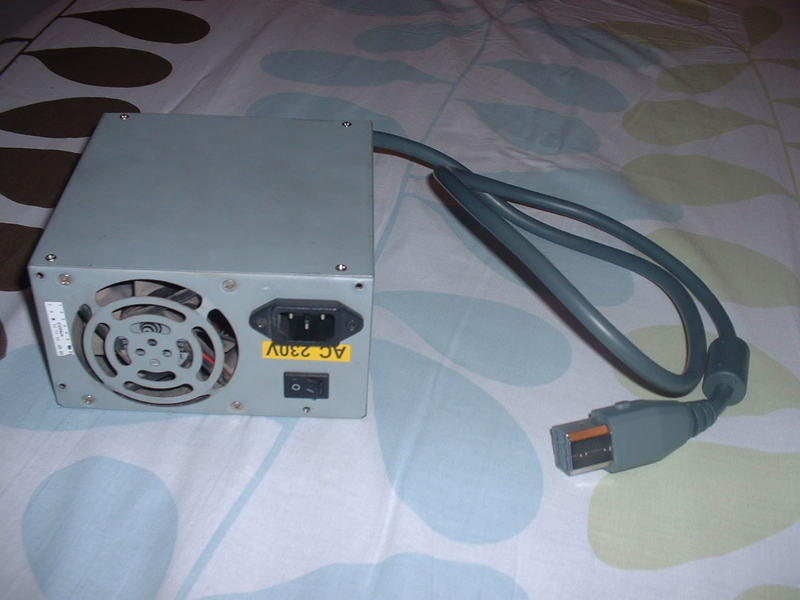 Had an old 500W power supply from my old computer. Hacked away at some wires, spliced a few together, Plugged it in… Turns out he still has a few months on his Xbox Live account :) Been playing Halo3 for a few hours now… No signs of overheating/etc..
I’ve performed this mod on a little more raw level from a different tut. I don’t think this one was posted yet, ended up soldering directly to the board, wasn’t aware of which wires went where for the PWR_ENABLE (Blue) and +5VSB (red) connections from the power connector, just bridged green/black on the psu. Mine’s a 1st gen Elite, worked great for about 6 months and started overheating on me. Match Blue (360) to Green (ATX PSU) to use PWR_ENABLE, which just means the ATX PSU turns on when you hit the 360 power button. I just completed this mod and it works nicely. Yes a transistor connected to the black, green and blue leads will work to turn the Xbox360 off and on. 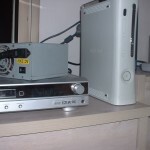 The reason you cannot connect the blue wire directly to the green wire is because the power supply expects the gree wire to be at zero volts to turn the power supply on and the Xbox360 power supply requires 3.3 volts on the blue wire to turn the power supply on. When connecting the wires to the computer power supply connect each yellow wire to a separate yellow wire on the power supply cable. The same applies for the black wires. That can be easily done if you have a newer power supply with an 8 pin 12 volt connector and will also give you an extra 12 volt wire and ground for running fans or in my case the water cooling system. I think the best way to hook up 5v and 12v and GND is to use one cable from the ATX PSU for each cable in the XBOX cable, that way there’s not too much current on any cable, so that way your cables won’t melt, like one commenter had. Its the sheer amount of power that an XBOX requires that melts cables. if you use flimsy cable for 16+ amps (more than your household outlets) you WILL melt cables. I am extremely impressed together with your writing talents and also with the format in your blog. Is that this a paid subject or did you customize it yourself? Either way stay up the nice quality writing, it is uncommon to see a nice blog like this one today..